B&B Drugs is now EPIC Pharmacy. Same local owners, same local pharmacists, same great customer service. Thanks for shopping LOCAL! Proudly serving the Metairie community for over 50 years. Thank you for the opportunity to be your local pharmacy. EPIC Pharmacy also specializes in the clinical needs of workers' compensation and personal injury claims. Welcome to EPIC Pharmacy! We look forward to serving your every need. Along with a full professional staff and an automated filling system, we will make filling your prescription a pleasant experience. Most prescriptions are filled within 15 minutes, while you wait. Barring any complications with your insurance company or physician, you will be on your way in a matter of minutes. 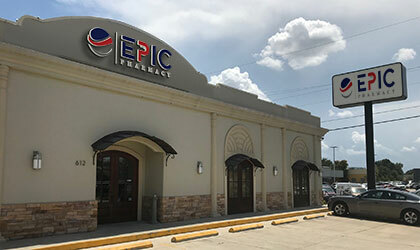 EPIC Pharmacy also offers over 4,000 square feet of merchandise to accommodate your every need. From vitamins, supplements, food and drinks to greeting cards, gifts, beauty supplies, and skin care, we carry the products you need most. All at discounted prices—every day! Supporting the Local Community for Over 50 Years! We feel our community chooses us and supports us, so we should do the same in kind. It's fast and easy to refill your prescriptions online. All you need is a prescription on file with us and a prescription number. Select a pickup time and pay when you pick up your meds. Experience the very best in customer service from the team at EPIC Pharmacy. Contact us to transfer your prescription today. We are committed to doing everything we can to make sure you receive the medication and support you need at the lowest cost possible, including specialty medications. Our team is well-versed in the state-specific nuances and clinical needs of workers' compensation and personal injury. EPIC Pharmacy is pleased to offer free, next-day delivery service to your home or office. Contact us for more info on our convenient delivery service. We stock medications and retail products for the entire family. From precious newborns to our beloved seniors, EPIC Pharmacy has you covered. Our locally-owned community pharmacy is more than just a place for prescriptions. Stop by for retail goods such as beauty supplies, skin care, diet & nutrition, household items and much more. We can administer a flu vaccine at little to no cost for most Medicare members and insurance plans. Talk to our pharmacist about which flu vaccine option is best for you. No appointment necessary. Have a question for our pharmacist? Wondering if we have a certain product in stock? Contact us today!